Today, Ladbroke Grove is famous for the Notting Hill Carnival, Portobello Market and providing a style that turns on Jarvis Cocker. In early Victorian times, you might have ventured here for a day at the races. Between 1837 and 1842, the Kensington Hippodrome could be found over what is now Ladbroke Grove, centered on a grassy hillock where St John's church now stands. The race course only lasted a few years. Neighbouring slums and a tendency to flood scared away the affluent classes. But its echo remains. The circular shape of Stanley and Landsdowne Crescents follows part of the track, while Hippodrome Place leaves no doubt. 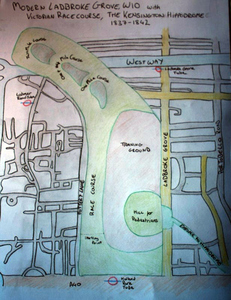 Reader Kathleen McIlvenna has superimposed the Hippodrome over a modern map of the area, as though the race course was never built over. In some alternative universe, your A-Z would look a little like this right now. There are just a few days left if you'd like to have a go at doodling your own neighbourhood, send images to tips - at - londonist.com. To be considered for our upcoming exhibition at the Museum of London, you'll need to get the hard copy to us within the next few days (address supplied upon application - please send an electronic version first). Previously: Albertopolis, Angel to Bankside, Borough of Southwark, Brixton as a tree, Central London, District Line (Wimbledon Branch), Central London with no street names, Driver's Mind Map, Fleet Valley, Hackney, Hampstead Heath, Hoxton Square, Isle of Dogs, London as a grid, King's Cross and Islington, Mayfair, Mayfair Squares, New Cross, New Cross (the fields of), Notting Hill, Paris versus London, Patchwork London, Pimlico, River Fleet, Primrose Hill, Rivers, Stoke Newington, Stratford, Toilets, Tottenham to Aldwych on bike, Walthamstow by mother and daughter, West Hampstead, Westminster kettling.